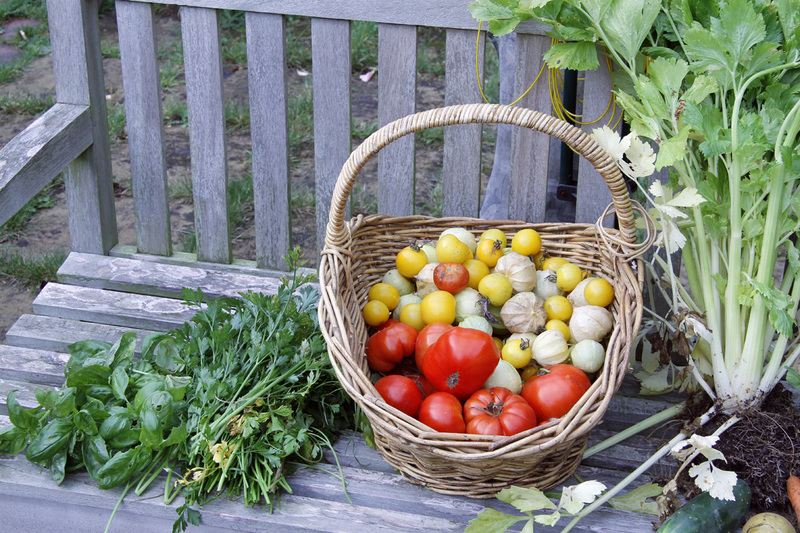 On Saturday I picked 6 cauliflowers. I blanched and froze 4 for future cauliflower cheese and decided to try a new recipe with one of them. 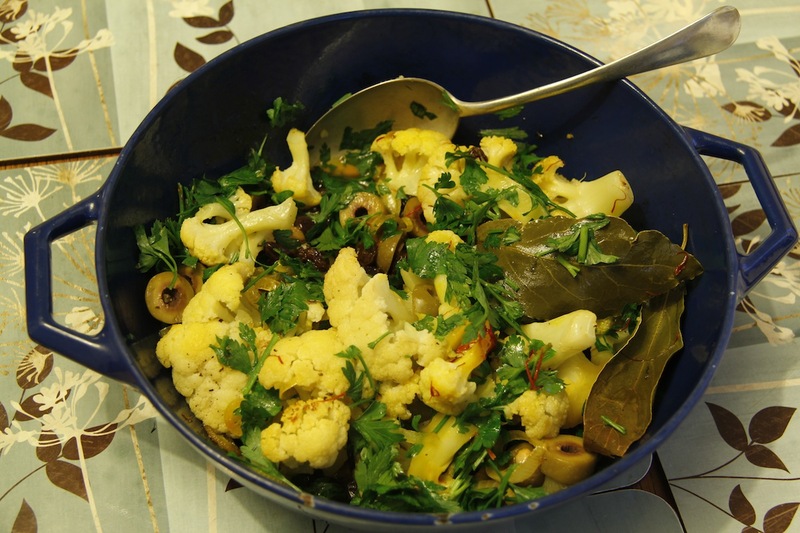 I had my eye on a recipe by Ottolenghi in Plenty (1-6) Saffron Cauliflower. It was pretty good. We had it with beetroot hummus – recipe here, cacik – recipe here and home-made flatbread. We had leftovers on Sunday with the addition of some roast (silkie) chicken). I might try it again next time I have a glut of cauliflowers and pair it with fish as suggested, but if I am honest it will not be one of his recipes that I return to every week or every few weeks – there are quite a lot of these as Plenty is one of my favourite recipe books. 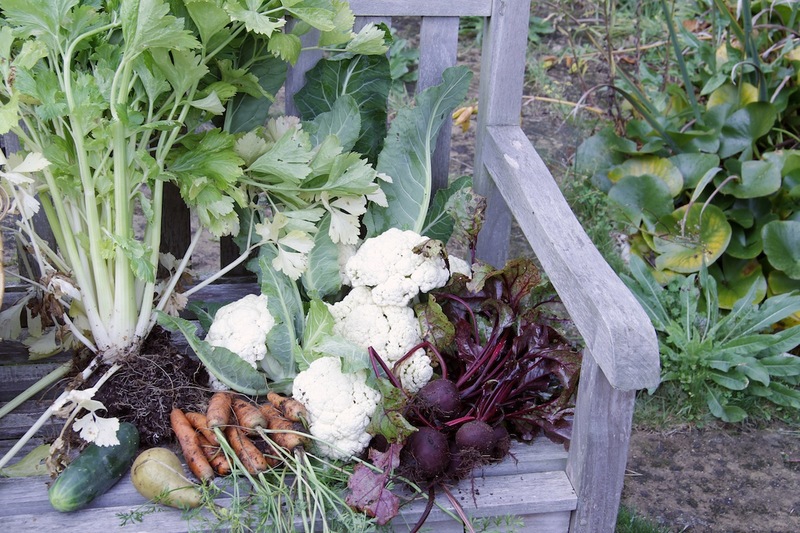 Rubbish photo as I used the wrong settings, but lots of cauliflower and celery, beetroot and carrots; one cucumber and the last pear! 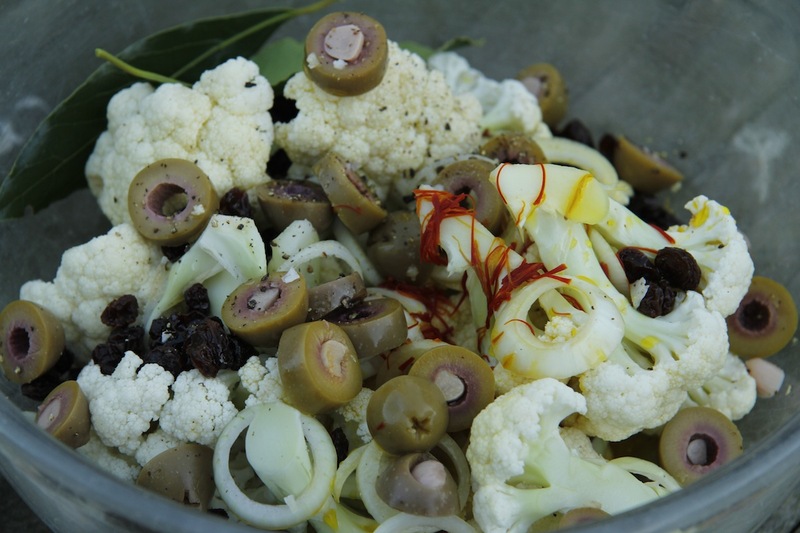 Saffron Cauliflower: 1 heaped tsp saffron strands soaked in about 75ml of boiling water; 1 cauliflower, 1 onion, handful of sultanas/raisins, handful of green olives (I used ones stuffed with garlic) sliced, 4 tbs olive oil, 2 bay leaves, handfuls of chopped parsley. Heat the oven to 200C. Add all the ingredients to a large mixing bowl except the parsley and mix well Put the mix in a ovenproof dish, cover and cook for 40-45 minutes. Halfway through the cooking time stir the mix. Once the cauliflower is cooked remove fr the oven and allow to cool. Stir through the parsley and then serve at room temperature.